Introduction: The use of limited transthoracic ultrasonography (LTTE) has been recently gaining popularity among physician anesthesiologists for diagnosis and treatment of susceptible patient population undergoing general anesthesia in the perioperative setting. Among many useful information that LTTE can provide in perioperative setting, the use of inferior vena cava collapsibility index (IVCCI) and its correlation to hypotension after induction of general anesthesia has been a recent topic of study (Zhang 2016). In this pilot study we attempted to determine the feasibility of LTTE in preoperative holding area in patients undergoing general anesthesia. Method: Ten adult spontaneously breathing patients undergoing non-emergent surgical procedures under general anesthesia who did not have a chest tube or abdominal surgical drain were enrolled in this study. An experienced critical care trained anesthesiologist used a A 5MHz phased array probe to obtain 3-window LTTE (parasternal long/short axis, apical, and subxyphoid) and to measure IVC diameters (in M-mode) necessary for calculating IVCCI (figure 1). The time required to obtain the images were recorded and analyzed. Result: The exam was performed in all 10 patients and attempts were made to obtain 3 windows and to measure the IVC diameters. We were able to obtain useful images and IVC measurements in all 10 patients, although not all 3 windows could be obtained in all cases. The average length of time required to perform the exam was 8 minutes and 33 seconds (SD=127 seconds). 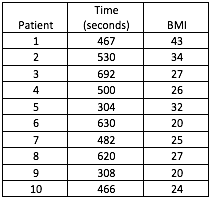 Interestingly, we found no significant correlation between the patient’s body mass index (BMI) and the amount of time required to complete the exam (r= -0.09). Discussion: LTTE is a useful tool that is commonly utilized in the ICU and ER settings and can provide physicians with valuable information such as the overall cardiac function, presence of pericardial effusion, volume status, and fluid responsiveness. In recent years limited echocardiography has been gaining popularity amongst anesthesiologists, hence it is imperative to assess its feasibility in the perioperative setting. Based on the result of our study, on average it takes around 8 minutes to perform the exam, which is comparable to a recent study done by trauma surgeons which found an average time of around 5 minutes (Ferrada, 2014). In our study, IVC diameter was measured twice in M-Mode in each patient, which can partially explain the difference in the length of the exam between the 2 studies. interestingly, we found no correlation between patients’ BMI and length of exam. 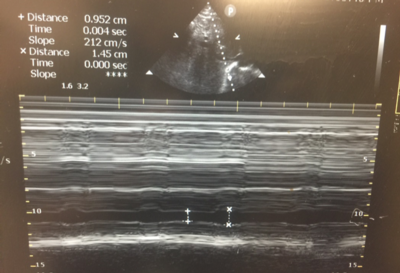 We identified other obstacles to performing echocardiography in the preoperative area including orthopedic hardware and limited space around stretchers. In conclusion, preoperative limited TTE could be feasible in the non-emergent surgical setting. Further studies with the use of preoperative TTE are ongoing and will further elucidate its utility as a perioperative hemodynamic monitor.